Point Pleasant senior James Musgrave (13) falls into the end zone for a touchdown during the second half of Friday night’s football contest against James Monroe at OVB Field in Point Pleasant, W.Va.
Point Pleasant junior Nick Leport (14) breaks away from a James Monroe player during the second half of Friday night’s football contest at OVB Field in Point Pleasant, W.Va.
POINT PLEASANT, W.Va. — James Monroe delivered an effective first punch. The Big Blacks countered with an overwhelming knockout blow. The Point Pleasant football team trailed less than five minutes into regulation, but the hosts allowed just 77 yards of total offense the rest of the way while reeling off 47 unanswered points en route to a 47-6 thumping of James Monroe on Friday night in the Week 11 regular season finale for both programs at Ohio Valley Bank Track and Field in Mason County. The Big Blacks (8-1) eventually celebrated Senior Night in style, but the visiting Mavericks (6-4) did their best early on to try and ruin the party. JMHS took the opening kickoff and put together an 11-play, 74-yard drive that resulted in its only points of the night as Thad Fullen scored from one yard out with 7:04 remaining. All 11 plays were rushes, with a majority of those going straight up the gut for significant yardage while building a 6-0 edge. The Red and Black, however, needed just eight plays to cover 63 yards en route to taking a permanent lead. Cason Payne scrambled nine yards and found paydirt at the 4:14 mark, then Oliver Skeie made the first of his three successful PAT boots to give the hosts a 7-6 advantage. 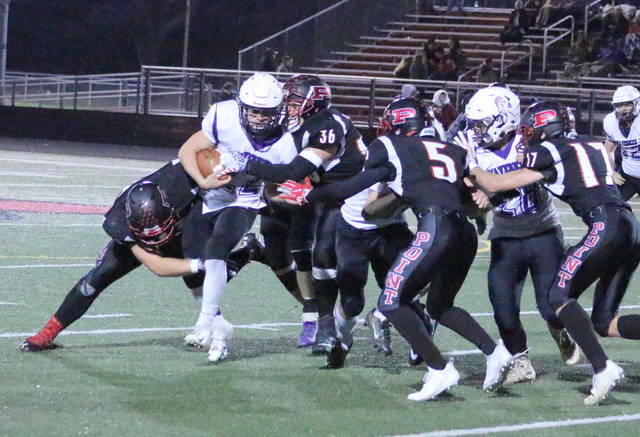 James Monroe had its next offensive possession end with a punt early in the second canto, and the Big Blacks needed only three plays to cover 48 yards as Payne found Aiden Sang on a 44-yard fly pass for a 14-6 cushion with 9:39 left until halftime. 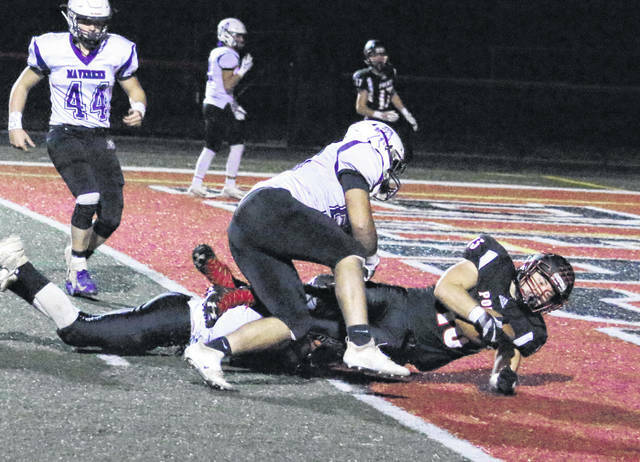 The Mavericks were forced to punt again, but the guests did force an interception on Point’s ensuing drive — but Point eventually got the ball back after recovering a fumble during the interception return. The Big Blacks answered with a three-play, 70-yard drive that ended with Josh Wamsley hauling in an 87-yard pass from Payne at the 4:51 mark for a 20-6 lead. Point forced another three-and-out on the Mavs’ next drive, then marched 61 yards in nine plays to increase its halftime lead to 20 points as Payne scored from three yards out with 27 seconds left — making it a 26-6 contest at the break. Again, after producing 74 yards in their first 11 plays on offense — the Mavericks yielded just four yards over the course of their next 13 snaps of the football. Point Pleasant, conversely, had 266 yards of total offense at the break — with 188 of those coming through the air. Both teams also rushed for 78 yards apiece in the opening half. 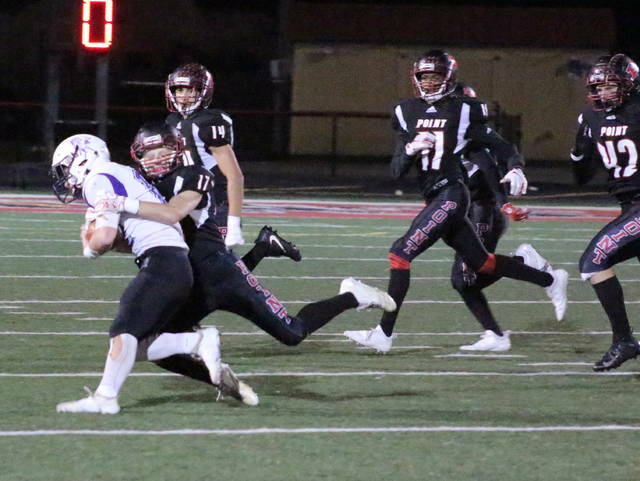 The Big Blacks kept that momentum moving forward on the opening drive of the second half as James Musgrave hauled in a 10-yard pass from Payne at the 9:22 mark. 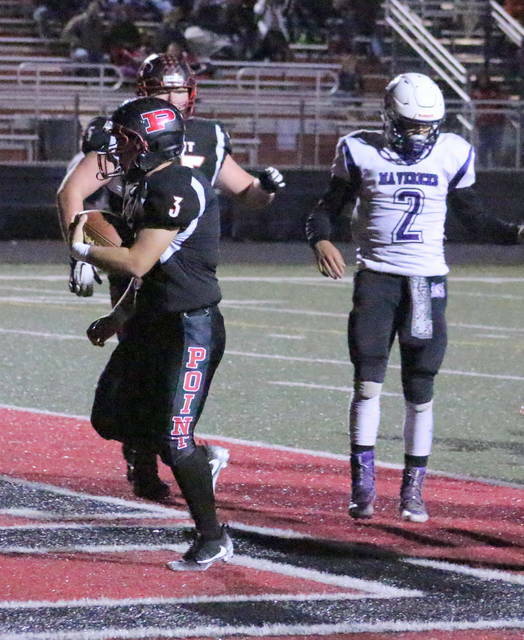 Brady Adkins caught the two-point conversion pass from Payne to extend the lead out to 34-6. The Mavericks’ ensuing drive ended about a minute later as Nick Leport scooped up a fumble and returned it 22 yards to paydirt — giving the hosts a commanding 40-6 advantage with 8:17 left in the third. Christian Holland completed the scoring with a two-yard run at the 1:16 mark of the third, wrapping up the 41-point outcome. The entire fourth quarter was played with a continuous clock due to the 35-point lead. The Big Blacks outgained the guests by a sizable 454-151 overall margin, which included a single game record of 262 passing yards by Payne. Payne — a four-year starting senior — completed 14-of-17 passes and threw three touchdowns to go along with one interception. Classmate Josh Wamsley also tied a single game record with seven catches for 143 yards, which included a touchdown grab. After the game, PPHS coach David Darst was pleased to see the way his troops responded to the Mavericks’ first possession. As he noted, it showed just how much character this group has headed into the program’s 11th consecutive postseason appearance. “I’m really proud of the way our kids responded to James Monroe’s opening drive. Earlier in the year, that would have probably been a problem for us,” Darst said. “But that defense, I mean they just absolutely turned it on after that. To hold a team that runs the ball as well and as much as they do to probably 150 yards, that’s getting it done. 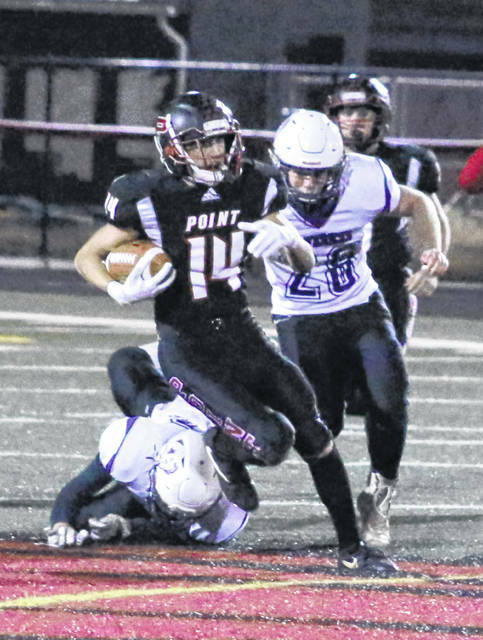 Point Pleasant claimed a 17-9 advantage in first downs and both teams committed a single turnover. The hosts were penalized six times for 67 yards, while JMHS was flagged four times for 27 yards. The Red and Black churned out 192 yards on the ground with 29 attempts, an average of just over 6.6 yards per attempt. The Mavs, on the other hand, gained 138 yards on 40 tries for just under 3.5 yards per carry. Despite a career night through the air, Payne still led the hosts with 61 rushing yards and two scores on 14 attempts. Adkins was next with 45 yards on 10 carries, while Holland added 10 yards and a score on three totes. Wamsley had 49 yards on a single rushing attempt to go along with his career night as a receiver. Sang had one catch for 44 yards, Adkins added three grabs for 24 yards and Zane Wamsley hauled in one catch for 34 yards. It was the final regular season home game for Josh Wamsley, Christian Holland, Cason Payne, James Musgrave, Ian Smith, Andrew Jones, Winter Nibert, Colton Carr, Eddie Mayes, Tyron Howell, Blayne Butler, Ryan Kinniard, Trevon Franklin and Devin Burris in the Red and Black. Darst acknowledges that his players are prepared for a road trip next week, but he’d really like to see these guys perform at OVB Field one more time. The 12th-year mentor — and the rest of the state of West Virginia — will have a much clearer picture of things sometime Sunday afternoon after the release of the official WVSSAC playoff brackets. Jaylon Lewis paced JMHS with 77 rushing yards on 10 carries. Monroe Mohler completed 1-of-4 passes for 13 yards, with Lewis hauling in the single grab.